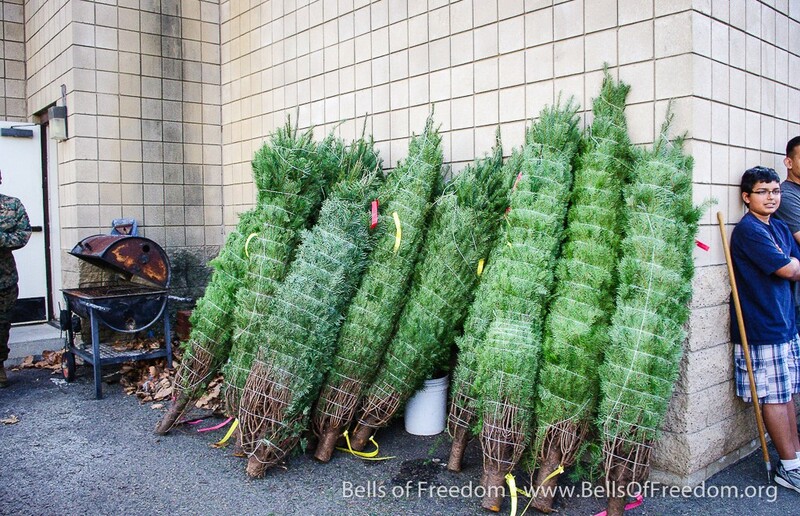 You can purchase a Christmas tree for a local military single enlisted or family in Bells of Freedom’s “Trees for the Troops” fundraiser for the Emergency Care Fund. This annual event is held simultaneously with “The Big Thank You” each year. With just $50.00, a beautiful 6-7 foot Christmas tree will be donated and delivered to enlisted singles and families at our local Camp Pendleton and MiraMar Bases in your name; or for those ‘hard to buy for’ people on your Holiday list, buy a tree in their name and Bells of Freedom will send them a Holiday greeting telling them of your gift in their name. 100% of the proceeds of the sale of the tree to go to Dance Hearts/Bells of Freedom’s Emergency Care Fund. Each purchaser will receive a tax deductible acknowledgement of the purchase for their use in completing any tax preparations. San Diego based Dance Hearts, a recognized 501 (c) 3 Public Charity and Bells of Freedom, a program specifically designed to care for our U.S. military and their families, has two annual events aimed at making the Holidays for our local enlisted men, women and their families just a little happier with Trees for the Troops and “The Big Thank You” whereby community individuals, groups and corporations are offered the opportunity to “adopt” a deserving enlisted military family needing a little extra support during the holiday season by providing food and gifts and deliver personally to those families in a meet and greet that takes place at Camp Pendleton, California. A 6-7 foot Christmas tree to be donated to our Troops. Cash donations of any denomination go a long way when totaled up at the end of the day. Cash donations allow the Bells of Freedom program to help just one more military family in need. We also gladly accept gift cards to grocery, gas, clothing stores, etc. Helping Us with Your Financial Support is Greatly Appreciated! However you decide to donate will help let those know who sacrifice each day to protect our freedom just how much you care. Dance Hearts/Bells of Freedom also welcomes cash donations as well as provide volunteer opportunities. Dance Hearts and the Bells of Freedom program has no paid directors, staff or volunteers and 98% of all cash donations go directly to the enlisted and the families we serve. Copyright Dance Hearts © 2019. All Rights reserved.